We have spent time over the last few months beginning to list the donated papers of Canon Kenyon Wright. Canon Kenyon Wright is best known as the Executive Chair of the Scottish Constitutional Convention which planned for Scotland’s Parliament, which came into being in 1999. Often referred to, by the media, as the ‘Godfather of Devolution’, he was made a CBE ‘for services to constitutional reform and Scottish Devolution’. Going through the boxes we have discovered that the papers contain a wealth of important material drawn from all stages of his working life which will complement and enhance our existing collections. Included amongst the material are papers relating to the People and the Parliament project. 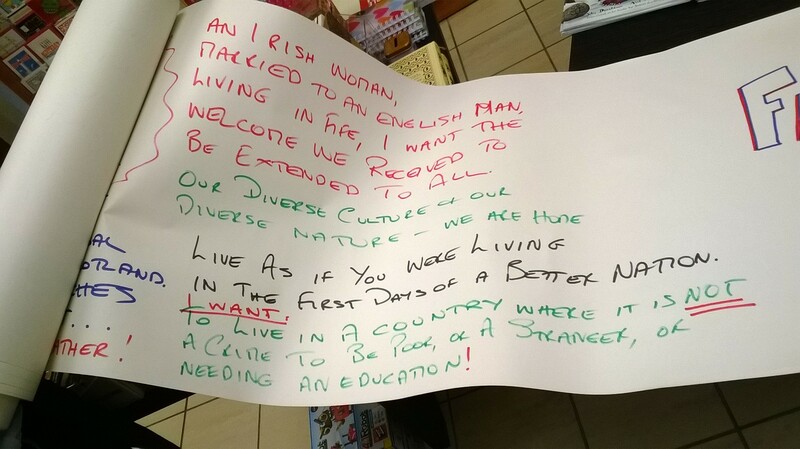 We are a people who…. By the year 2020 we would like to see a Scotland in which…..
We therefore expect our parliament to work with people in ways which…….. In 1999 the Project reported back their findings and the archive includes correspondence, minutes, handwritten notes and papers relating to the project. These papers are still in cataloguing but we hope they will be available to interested researchers soon. The 1997 referendum came shortly after the 1997 General Election, which saw a landslide victory for New Labour. In power, Labour quickly passed the Referendum (Scotland and Wales) Bill. The holding of a referendum on the establishment of a Scottish Parliament was not Labour policy until June 1996 and was not well received by those who had been campaigning for a Scottish Parliament and who had worked a scheme for devolution through the Constitutional Convention. Labour had reached this position due to Conservative campaigning on the ‘tartan tax’ (the proposal for income taxation powers for the devolved parliament). To escape the problem and ensure there was Scottish popular consent for devolution, Labour decided to hold a two question referendum on the issue. Voters were asked two questions whether there should there be a Scottish Parliament? And whether this Parliament have tax-varying powers? The 1997 referendum was a pre-legislative referendum – which meant that the referendum would be held before legislation was put before parliament. However, details of the devolution proposals were published in a best-selling government White paper in July 1997. Voter endorsement for devolution in advance was also seen to make it hard for opponents in the House of Commons and House of Lords to oppose the changes. The 1997 referendum campaign saw cooperation between the main political parties and the formation of two distinct umbrella groups to campaign for a Yes Yes or No No vote. 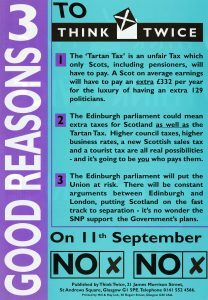 The No campaign was entitled Think Twice, a reference to the two questions that voters were being asked. 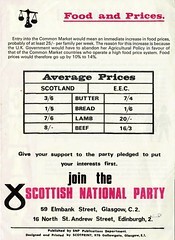 The organisers included Conservative figures such as Brian Monteith and Donald Findlay. 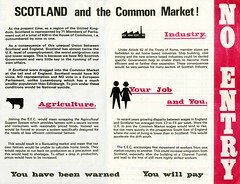 In the 1979 referendum the No campaign had benefited from the backing of the majority of Scottish business as well as from Labour MPs. However, business opposition to devolution was much more muted in 1997 and active Labour opposition was limited to West Lothian MP Tam Dalyell ‘I was wholly against it but the party was completely committed to it. I was a relatively lone voice against it’ (SPA/754). The campaign on the ground was quite low key as the majority of No campaigners came from a Conservative Party that had lost all of its seats in Scotland at the 1997 election and expected to lose the referendum too. Peter Fraser, Chair of Think Twice (SPA/791). Organisation was described as ‘embryonic in form’ and campaigners felt that they did not have the time to build up any head of steam in the No campaign. The Yes campaign was entitled Scotland FORward and included representatives from Labour, Liberals and the SNP. 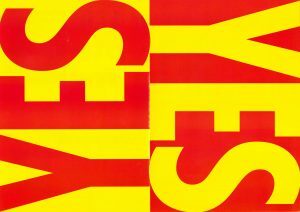 Although each party produced its own literature in its own colours there was uniformity in design for those involved in the Yes campaign. Although campaigning on the ground was often done separately by the individual parties, the perception was of cooperation to secure a Yes vote. 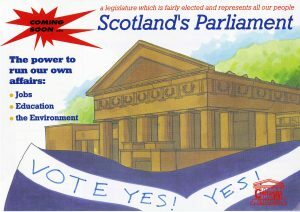 Campaigners knew that this was crucial to the campaign as is illustrated by Nigel Smith, Chairman of Scotland FORward. ‘The only strategic aim of the campaign was to prevent an outbreak of argument about policy or person between the SNP and Labour’. Many campaigners on the Yes side felt that the outcome was inevitable and that the establishment of a Scottish Parliament was, as John Smith put it ‘The settled will of the Scottish people’. 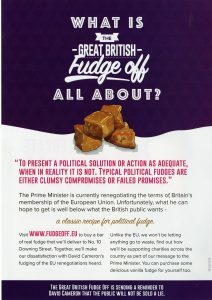 Activists recognised the danger of voters becoming bored with a drawn out campaign and planned an intensive last few weeks of campaigning before polling day. The death of Princess Diana on 31st August, however, suspended all campaigning until 6th September, which meant that many planned campaign events did not take place. 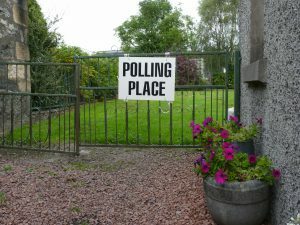 The polls opened on 11th September and 60.4% of the Scottish electorate came out to vote, which was 3.4% less than the turnout for the 1979 referendum. However the result was much more conclusive with 74% voting yes to the establishment of a Scottish Parliament and 63% voting in support of tax-varying powers. This was a decisive victory for the Yes camp and paved the way for the establishment of the Scottish Parliament. The Scotland Bill was published in December 1997 setting out a Parliament of 129 MSPs. It included details of the powers which would be reserved by Westminster and those that would be devolved to Scotland, as well as financial arrangements and tax varying powers. With the momentum provided by the overwhelming yes votes the Bill passed quickly through the Commons and Lords with minimal amendments and received Royal assent in November 1998. The first election to the Scottish Parliament was held on 6th May 1999. The outcome was a coalition government between Labour and the Liberal Democrats led by First Minister Donald Dewar. Following the Scottish Election Acting Presiding Officer Winnie Ewing opened the Scottish Parliament on 12th May 1999 with the following words. Tracking down everyone associated with the Bus Party from either 1997 or 2014 is a challenge. 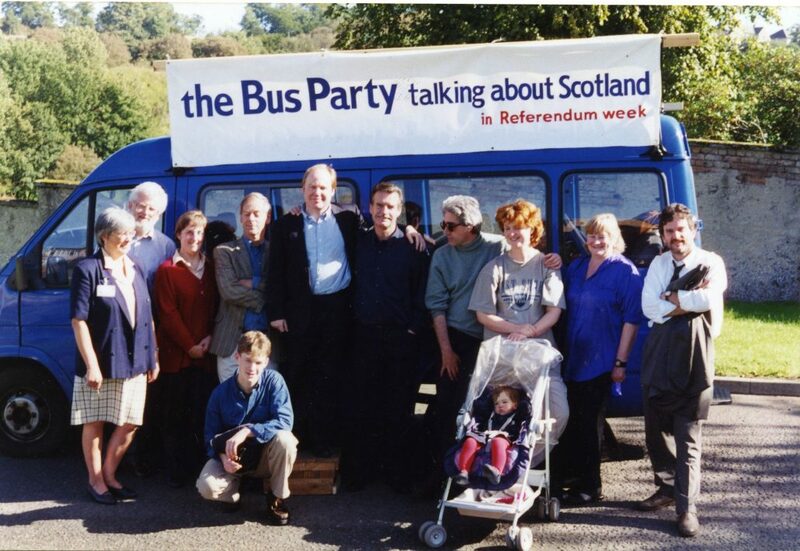 And it’s one you can help us with – we know who most of the people are in this photo: we can identify from left to right Danus Skene (who drove the bus), Neal Ascherson, Will Storrar (standing tall on a box), William McIlvanney, folk music performers David Francis and Mhairi Campbell (with their bairn in a pram) and Alan Miller at the end. But who are the others? Can you help us to identify them and their roles in the Bus Party or with Common Cause? A very enjoyable day was spent yesterday installing the Bus Party exhibition in four libraries in West Dunbarton who had hosted Bus Party events in 2014. We started in Alexandria, moved on to Dumbarton, then Dalmuir and finally Clydebank. The Bus Party visited these venues over two days in May 2014 and musicians and writers present included James Robertson, Neal Ascherson, David Greig, Hamish Moore and David Francis. Many thanks to the West Dunbarton staff for allowing us to install the exhibition there. 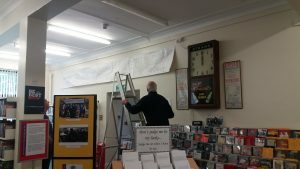 Particular thanks go to to Allan for facilitating the exhibition and Graham for helping to hang the banner up high in each of the libraries. As well as collecting leaflets for the General Election we are taking photographs to document campaign activity. 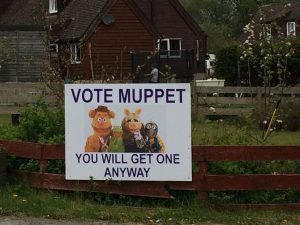 These posters for the Local Council Elections were spotted gardens in Dalry, North Ayrshire. 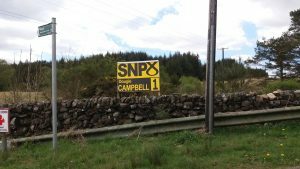 If you spot any campaign posters please take a photograph and email it to scottishpoliticalarchive@stir.ac.uk Please remember to also keep the leaflets that you get through the door as we would like to add them to the archive. With a new General Election upon us the Political Archive are as usual collecting election leaflets to document the campaign messages of the individual political parties all around Scotland. However, we need your help to collect leaflets from as many of the 59 constituencies as possible. We’ve all been subject to political campaigning at elections and referendums in one way or another and have some preconception of what it involves. Yet campaigns have seen significant developments and innovations that have changed the nature of campaigning and its reach into our lives. In the UK, the franchise extensions of the 19th and 20th centuries were some of the biggest creators of change in the electoral arena – and the extension of the franchise in 2014 brought it into schools too. Besides the franchise reforms, technology and the professionalization of political organizations have been important generators of campaign change – such as the impact of television, the development of national campaigns, seat targeting strategies, the role of information technology and direct mail and not forgetting an internet that allows individual communication about politics with friends and family as well as mass campaigning via big data through Facebook and Youtube. When Günter Grass went on his campaign tours in the 1960s, he was never sure whether what he was doing was actually effective. Yet, he toured West Germany with colleagues in a mini-van, giving talks, speeches and readings, as well as poetry and song. He was adept at using TV, radio and the newspaper to spread his political message but often, his political campaigning involved turning up in the market square of a small town and speaking from on top of the van. As one of Germany’s most prominent authors, he was certainly a draw when it came to events like this and, what he did tells you something about ‘alternative’ political campaigning away from policy platforms, leaflets and earnest speeches: Grass sought a livelier campaign that actually connected with real people in their communities on a daily basis, to break out of the campaign bubble and talk with people. That’s what Scotland’s Bus Party attempted in both 1997 and 2014 – getting out into the country and meeting people in their towns and villages to take the temperature of Scotland and encourage people to express themselves and to find out what they were thinking. Doing so did not involve the formal politics of speeches, leaflets and direct mail, but rather a tour of readings, poetry and song. Whilst the short 1997 tour stood out amongst the more orthodox political campaigning by the Yes and No sides to devolution, the 2014 experience was quite different. The Bus Party 2014 co-existed with a range of other campaigns like National Collective and TradYes– as 2014 exhibited a fair degree of artistic engagement and political carnival and a lot of unorthodox campaigning. For sure, there were public meetings, leaflets, campaign broadcasts, doorstep and phone canvassing and all the things you’d associate with traditional political campaigns but these were interlaced with new voices and unorthodox campaigning. 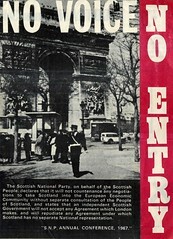 The Bus Party toured Scotland with its artists, musicians and writers, but it was an independent initiative – it sought discussion. It did not advocate for Yes or No in 2014. It had music from Karine Polwart, readings by James Robertson and song from Jamie McDougall, amongst many others. By contrast National Collective acted more as a political organization holding local events and campaigning for Yes, before it created its own bus tour of Scotland with Yestival and then a series of events at the Edinburgh festival in August 2014 – mirroring the Bus Party practice of art, music and readings, as well as dance, cartoons and a large dose of satire. The net effect of these types of organisational initiative was to help to the 2014 referendum a unique experience when it came to engagement and turnout. An exhibition showcasing the Bus Party Archive is now on display at the Lochgelly Centre and Montrose Public Library. A very happy day was spent today installing the Bus Party exhibition at the Lochgelly Centre. The archive are particularly pleased to be exhibiting at the Centre as it is such a hub for the local community boasting a cafe, theatre, art studios and the local library. The exhibition is on display in the lobby of the Centre and also on way down to the Theatre. 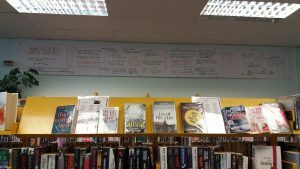 We took advantage of the Centre’s hanging system to hang our framed images and several banners from the Scroll of Thoughts including, of course, the banner completed in Lochgelly on 28th May 2014. These banners are not the original scroll, which is safely stored away in tissue paper in the archive, but robust vinyl copies. These copies will hopefully survive the rigours of being on display in various open venues and will allow visitors to see what hopes people had for the future of Scotland in 2014. The Lochgelly exhibition is part of a larger tour bringing the exhibition back to the communities who participated in the 2014 Bus Party and helped to create the archive collection which is held at the University.